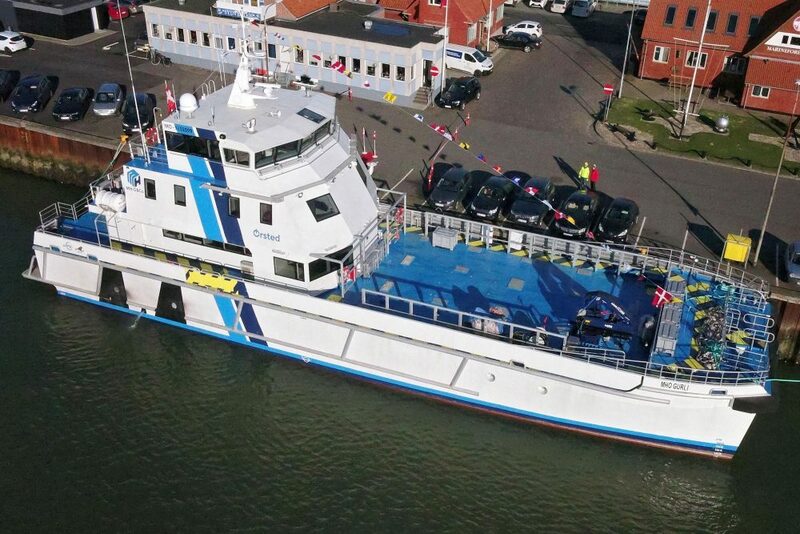 Incat Crowther recently delivered the 39m Multipurpose Crew Transfer Vessels MHO Gurli and MHO Esbjerg. The vessels were built by PT Bintang Timur Samudera in Indonesia and delivered to MH-O & Co to be operated for Ørsted in their Hornsea Project One offshore windfarm. The vessels, designed by Incat Crowther, are the largest Windfarm Support Vessels to enter service to date anywhere in the world. They draw on Incat Crowther’s experience with larger offshore fast catamarans operating in the oil and gas industry. The platform was specifically designed to deliver exceptional seakeeping, stability and comfort, whilst accommodating a highly redundant quad-engine / quad-jet propulsion package.Unique to these vessels is the installation of continuously rated marine diesel engines, offering increase reliability and reduced maintenance costs. The large Incat Crowther 39 platform is maximised with an aft-mounted superstructure, affording space on the stern for a transverse 20’ container and an extensive working deck forward. The result of a collaborative effort between MH-O & Co and Incat Crowther, this layout offers impressive functionality and accommodates many different load conditions including a variety of turbine maintenance operations. Among these operations is a turbine gearbox swap. With the turbine gearboxes weighing in at 32t each, this operation requires a stable and well-designed platform. Other equipment on the main working deck includes a deck crane, ship’s boat and EU pallet tie-downs, in addition to hard points for task-specific winch installations. In total, 33m of containers can be carried on this deck. MHO Gurli has already been approved for transfers in significant wave heights exceeding 2m. The main deck cabin is entered through the wet foyer at the aft end, with lockers, showers, toilets and change facilities for technicians and crew. Forward of this is a crew lounge to port and a crew lounge to starboard. Seating for 24 technicians is provided forward of this, with excellent forward visibility and KAB suspension seats enhancing comfort. A set of stairs each side from the main deck cabin lead to the hulls, which house large storage and workshop facilities amidships and resting areas forward. Upstairs, the mid-deck houses sleeping quarters for six crew members and two spare cabins, all in single berth cabins.Pairs of cabins share an ensuite, while the master and officer cabins have their own ensuite bathrooms. MHO Gurli and MHO Esbjerg are operated from the third deck, where the wheelhouse and workstations enjoy uninterrupted vision of the turbine tower and surrounding working areas. The vessels are fitted with a quad propulsion package, made up of four Cummins KTA38 main engines coupled to four KaMeWa S50-3 waterjets. This package gives MHO Gurli and MHO Esbjerg excellent flexibility and maneuverability, as well as redundancy. The top speed is 30 knots and service speed 25 knots, with endurance for fourteen days of 24-hour operation, with capacity for 62,000l of fuel.